Unless you’ve been living under a rock all weekend, you’ll know that Britain voted to leave the European Union on Thursday. Social media had a field day. Memes, parodies, inspirational quotes – you name it, the internet had it covered. Here we round up some of the funniest tweets of what was a crazy weekend politically and digitally. Make sure to check out our article on how Twitter reacted to Brexit’s impact on disabled people. 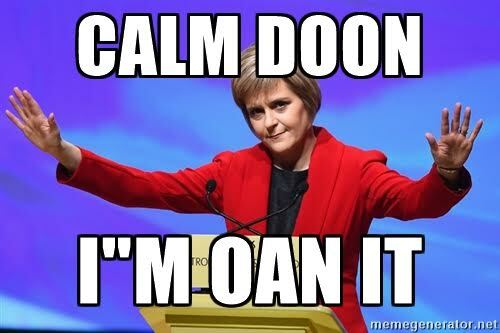 Nicola Sturgeon set off meme generators across the country when she spoke of a second Scottish independence referendum and whether Scotland could block Brexit. Some voters proposed a new Prime Minister. Others remembered the last time the country was horribly divided in opinion. Some Paralympians found their own way of blowing off steam. Click here to see how Twitter reacted to Brexit’s impact on disabled Brits. Disability rights campaigners promised to Stay Strong and Fight On. Scottish band Young Aviators parodied Dandy Warhols with their “Feel So European Just Like You” song discussing Scotland’s position on the Brexit vote. Jeremy Corbyn came under fire this weekend, with 18 members of the Labour team abandoning ship in protest of his leadership. Rather than resign, as many expected him to, Corbyn remains and has appointed 10 staff in new jobs. Seinfeld parodies summed up Britain’s instant Bregrexit. Got an opinion? Got a MEME? We want to see it! Tweet us to @enablemagazine or come say hi on our Facebook. Be the first to comment on "Brexit, Regrexit and Memes for Days"